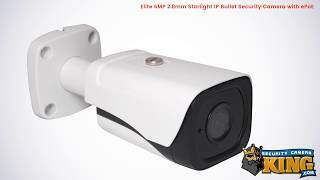 This 6MP IP Network Security Camera is a bullet style from our Elite series. With an IP67 weather rating and a 6KV lightning rating, this camera is sure to be a favorite choice for indoor and outdoor installations. It’s equipped with many of the latest features available in the CCTV industry today and one of our favorites is WDR (Wide Dynamic Range). By using WDR technology, you’ll have video that is balanced to prevent shadows and washed out areas. The better quality and higher resolution is necessary when you need to accurately identifying a criminal and it makes for an easier time when viewing. 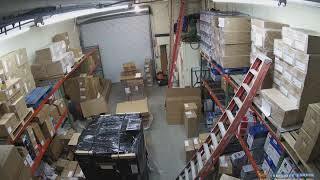 Sometimes camera placement becomes an issue because of the distance from the power source or NVR. This camera is equipped with extended PoE or ePoE and that might be an answer to those distance problems. With ePoE, you can install the cameras up to 800m from the power and data sources and still achieve speeds up to 10Mbps and up to 300m with speeds up to 100Mbps while still using existing CAT5 or Coaxial Cable. Customize your experience with the IVS (Intelligent Video System) while you set options like Tripwire crossing alerts, intrusion detection, tamper detection, face detection while the camera monitors for abandoned and missing objects. H.265+ video compression is the latest video compression available that reduces bit rate and storage requirements by up to 70% when compared to standard H.265 video compression. Using this setting will help to reduce network strain and storage space by reducing file sizes. You’ll notice the difference with resolutions as high as 6MP and everywhere in between, all the way down to 1MP. You’ll see a dramatic difference over your existing 1 or 2 megapixel cameras and with the 2.8mm fixed lens, you’ll get sharp and clear video whether you’re looking over a large parking lot or inside a small office space. There’s no need for you to have to deal with pixelated video anymore! The STARVIS™ sensor works to give you bright, vibrant video during the day and at night, you can count on the built in LEDs to supply you with up to 131 feet of nightvision in low light and total darkness. We want your buying experience to be a good one so we’ve included a 2 year warranty, free US based tech support, and free remote viewing software.